The consecration for an author is to see his name becoming more famous than his books. When his name is familiar to everybody and merely common, he reaches a kind of crowned achievement. It is the case for Jean Zilio. He is an instructor pilot with a large flying experience and a real talent to transmit it while teaching all his pupils, professional pilots or only private ones. The different documents, he created for his lessons, are gathered in this Flying Practicle Handbook reaching its eighth edition. Several generations of pilots using it during their training had participated to its real success. Why such an interest for this Zilio ? 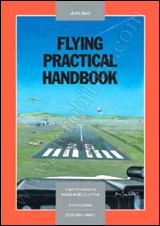 Because this handbook is less theoretical than the other official ones, and gives many practical advices for correct flying. Thematic cards explain clearly the basic control manoeuvres and the best methods to find the safest air trajectories. They are clearly illustrated with drawings and graphics of the author, a good way to show how to get progressively a full pilot’s skill and ability. Obviously, this handbook is useful for the beginners and student pilots but offers also good information and refreshments to more trained, and it is very easy to use from 0 to 25 000 flying hours logged.